This Vegan Shepherd’s Pie honors the traditional Shepherd’s Pie casserole I grew up on. Dare I say, it’s even better!? The first layer is made up of a hearty sauteed vegetable-lentil mixture, topped off with a thick layer of comforting mashed potatoes and baked until golden brown. Did you grow up on Shepherd’s Pie? It was a Winter staple at my home growing up. Meals like this are the best when the cold weather hits because they make you feel completely warm and cozy. Best eaten at extremely cold temperatures, snuggled up in a fuzzy blanket by the fire. 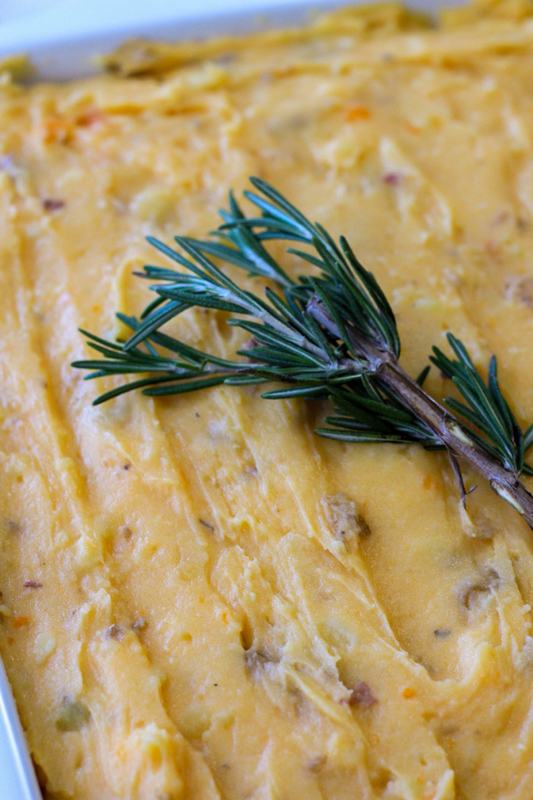 The secret to getting G-O-L-D-E-N Vegan Shepherd’s Pie like this one is to add one very sneaky sweet potato to your mashed taters. It’s just enough to step-up the flavor profile of this recipe and makes this Winter casserole the most gorgeous colour. I make my Mashed potatoes in under 20 minutes flat in the Instant Pot. The above veggie-lentil mixture is the bottom layer of my Vegan Shepherd’s Pie. 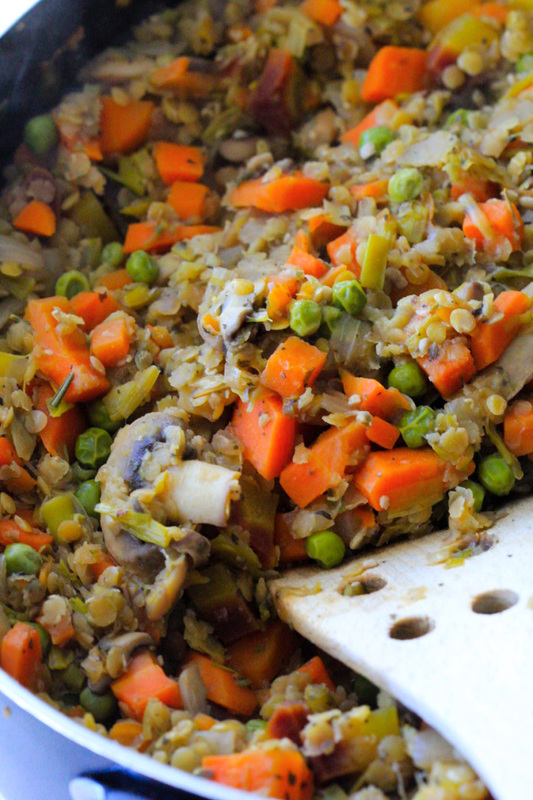 It could not be heartier and is made with onions, leeks, garlic, carrots, mushrooms, peas, and herbs. The lentils are added in at the end and help everything come together. Top off with the mashed potatoes. Smooth out the top with the back of a spatula or spoon and top with fresh rosemary. If you’re wondering what the “flecks” are in my mashed potatoes, I always leave the skin on when I make mine. Potato skin is filled with so much goodness it’s a shame to let it go to waste! 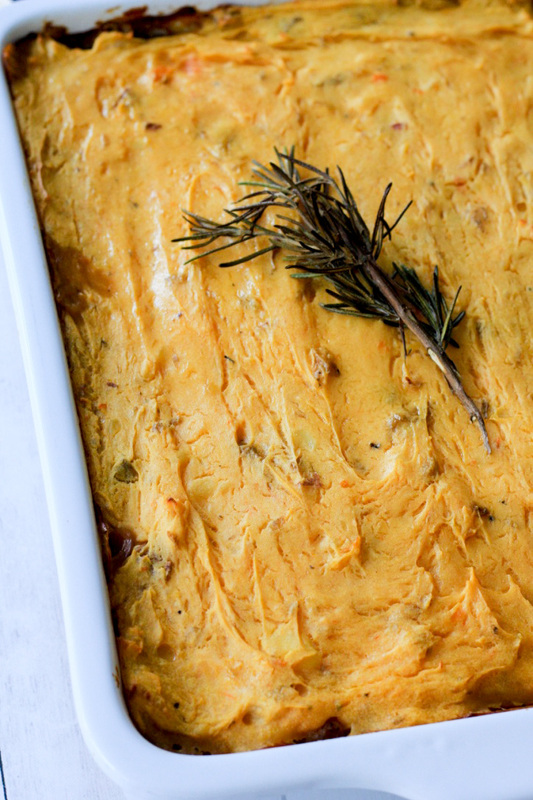 Bake the Vegan Shepherd’s Pie for 40 minutes until super crispy on top and golden brown. Serve with Easy Vegan Gravy for a real treat! Traditional Vegan Shepherd’s Pie.The first layer is made up of a hearty vegetable-lentil mixture, topped off with a thick layer of comforting mashed potatoes and baked until golden brown. Boil the potatoes: Place the halved potatoes in medium-sized pot. Cover with an inch of cold water. Add a pinch of salt. Bring to a boil, reduce to a simmer, and cook until tender. This will take about 20 minutes. Lentil Vegetable Mixture: Saute the onions, leeks, garlic, and herbs in a large-deep pan (or dutch oven) with a splash of water until the onions and leeks are tender. Add the mushrooms and carrots to the pot. Add a dash of salt and pepper. Cook until the mushrooms reduce to half their size, adding a splash of water when necessary to the pan so the vegetables do not stick to the pan. Add the frozen peas, red lentils, Worcestershire sauce, bouillon, and water to the pan. Bring to a simmer, and cook until the lentils are cooked (about 8 to ten minutes). Stir the vegetable mixture and blend 1/3 of the vegetable mixture with an immersion blender (this will give it that perfect, hearty texture). Taste test and add additional salt, pepper, and herbs to taste. Mash the cooked potatoes: Cook the potatoes until the are easily pierced with a fork. Drain the potatoes and place them back in the pot. Add 2 tbsp of soy milk, garlic powder, sea salt, and pepper. Lightly blend the potatoes with an immersion blender until the potatoes are fluffy and thoroughly mashed. Add a splash more soy milk if necessary. Assemble the casserole: Spread the lentil vegetable mixture in an even layer in a large baking dish (8×13 casserole dish). Place the mashed potatoes on top. With a damp spatula, smooth out the mashed potatoes on top. Place the fresh rosemary on top of the potatoes. Bake for 40 minutes until golden brown. Leave to cool for ten minutes before serving. Mashed Potatoes: Add the potatoes and 2 cups of water to the Instant Pot. Pressure cook on high for 13 minutes and then quick release until the steam releases.. Drain the potatoes and transfer to a separate large bowl to mash. Follow the rest of the instructions above. Lentil Vegetable Mixture: After making the mashed potatoes, sauté the vegetables as per the instructions above in the Instant Pot on the high setting. Add the frozen peas, red lentils, Worcestershire sauce, bouillon, and water to the Instant Pot. Pressure cook on high for 3 minutes and use the quick release until the steam releases. Follow the rest of the instructions above. I do not peel my potatoes because I like a little bit of the potato skin in the mashed potatoes. Feel free to peel them if you prefer. 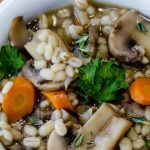 I used dried lentils – not canned! 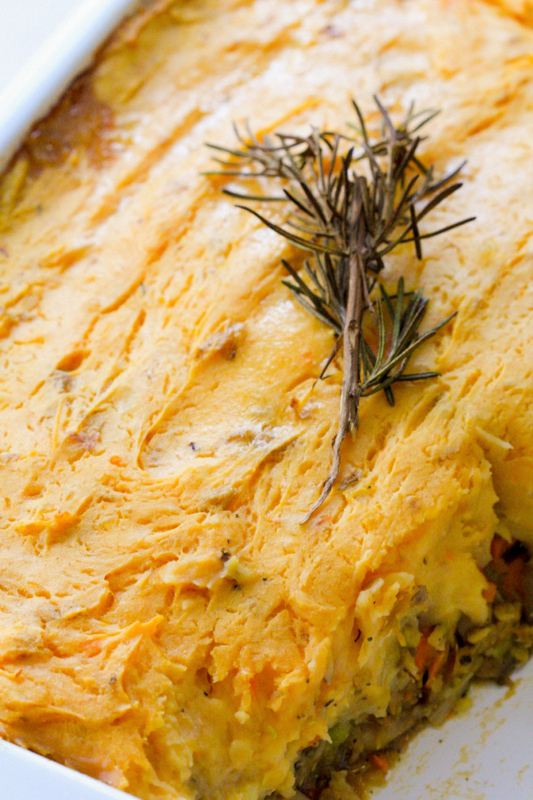 Absolutely love shepherds pie and yours looks incredible! Brilliant to add sweet potatoes to the mash. It adds such a wonderful hearty color and no doubt makes the flavor amazing! I have never had shepherds pie! Looks so hearty though and a perfect dinner on a cold cozy night! Shepherd’s Pie is one of my favourite dinners. 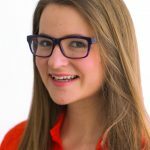 I love that you have combined sweet potato and regular potato for the topping! This looks like total comfort food! I don’t make shepherds pie nearly enough. Total comfort food! Your mashed potatoes look SOOOOO super creamy! YUM! Oh my gosh, YUM! 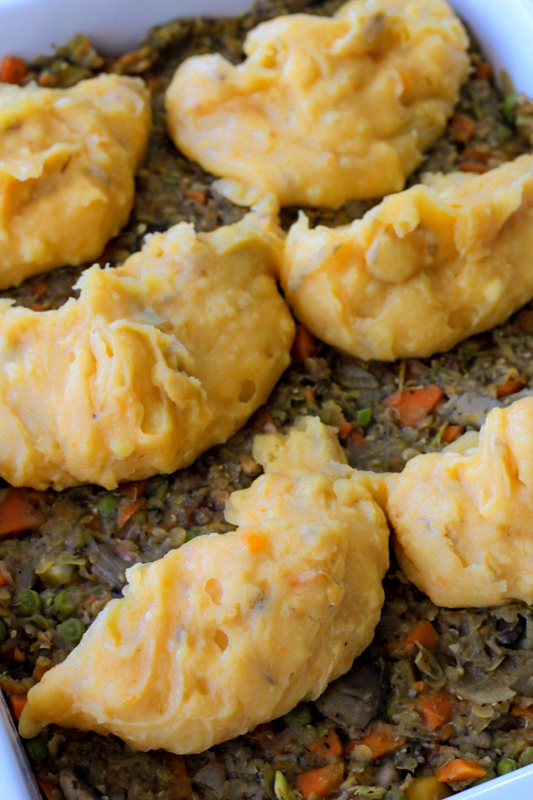 We love shep pie at my house, and your lentil version is awesome!